On the journey of writing my memoirs, God redirected my efforts to writing Bible studies. I couldn’t wait to share with others how God’s Word had impacted my life. Learning to embrace God’s truth and live in light of its’ power continues to motivate me. Pastor Dr.Charles L. Allen, in his book, God’s Psychiatry writes about a nervous, tense, worried and sick man who came to see him on the recommendation of his physician. Dr. Allen took a sheet of paper and wrote out a prescription for him. “I prescribed the Twenty-third Psalm, five times a day for seven days.” He has documented many positive results with those who follow the simple process diligently. Such is the power of the Word, when read carefully, meditatively and prayerfully. The first, Women of Worth, was released in 2009 and focused on four topics: Woman of Worth, Woman of the Word, Woman of Wisdom and Woman of Worship. My passion for this topic stemmed from my own depression. I wanted women of all ages to understand a Biblically based, healthy sense of worth, move on to memorize, meditate on and apply God’s Word to each day. It seemed like too many topics in one study book. So I began the journey of expanding and having a book on each of the WOW topics. That one course is expanding! Thus began the four book WOW Bible Study Series . 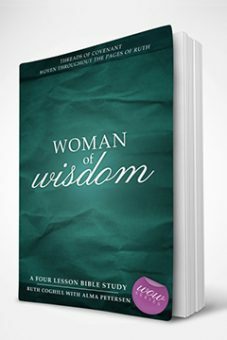 Each of the four books contains four lessons for the time-conscious woman, who desires a fresh approach to God’s Word. Book One in the WOW series, Woman of Worth-Lifelong Encouragement From Psalm 139 is published by Word Alive Press, 2011. In this first book, I guide the participant through the Psalm to see God’s personal interest in each of them: He knows you, He is with you, He created you and He defends you. Each lesson begins with a personal story, starting with my depression in Lesson One. Available here at the Store. is a hands-on, step-by-step study to engage a group of women to collectively learn Psalm 8 during the four weeks together. Such power in the memorized Word. Available here at the Store. Book Three, Woman of Wisdom- Threads of Covenant Woven Throughout the pages of Ruth has been co-authored with my sister, Alma Petersen. Book Four, Woman of Worship- Entering God’s Presence Through the Old and New Covenant is in the beginning stages.